Remodeled from top to bottom not long ago 2012-2013 with beautiful hardwood floors, stainless appliances, a new slider that goes out to a spacious deck, that overlooks a nicely landscaped yard. Brick fireplace sets off the tone of the open living room, dining area & kitchen. Combination laundry-pantry is just off the kitchen. 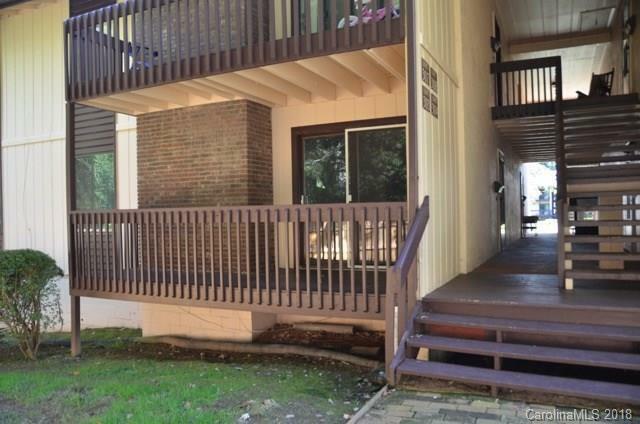 This is a Hard to get Ground level unit with 2 large bedrooms & 2 baths. The bedrooms offer extra large windows looking out to a private yard. Walk-in closets, both baths have been tastefully remodeled with furniture grade cabinets, tile floors, tile surrounds & tub-shower units. The Open kitchen offers plenty of cabinets & countertops & joined by a decent size dining area. Beautiful hardwood floors shine like new. This unit is a true walk to town, the library, dining, shops, restaurants & sidewalks. Brevard is a biking haven with the nearby DuPont, Pisgah National Forest, Gorges State Park. Bike straight thru town to Bracken Mountain trails & into the forest.